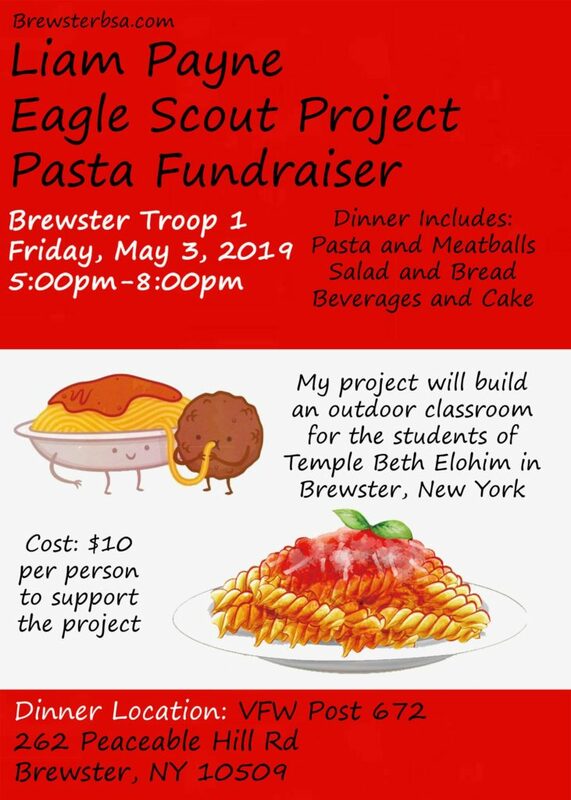 Please consider attending Liam Payne’ s Eagle Scout Pasta Fundraiser for his Brewster Troop 1 Eagle Scout Project. 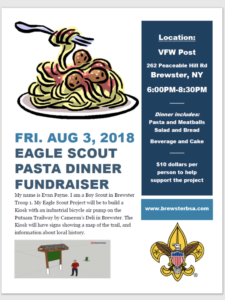 This Pasta Fundraiser will be Friday, May 3, 2019 from 5-8PM, at the Brewster VFW Post located at 262 Peaceable Hill Road in Brewster, NY. Please see Liam’s flyer for more details. Liam’s project is designing, building, and installing benches, a platform, and a podium for an outdoor classroom at Temple Beth Elohim for their Sunday School. Thank you for considering attending and for supporting our local Boy Scout Troop and the troop’s service projects. Congratulations to John Imor, who has become Brewster Troop 1’s newest Eagle Scout today, after completing his Eagle Board of Review. John’s Eagle Project installed a flag pole and walkway for the Elk’s Lodge in Brewster, NY. Congratulations, John! 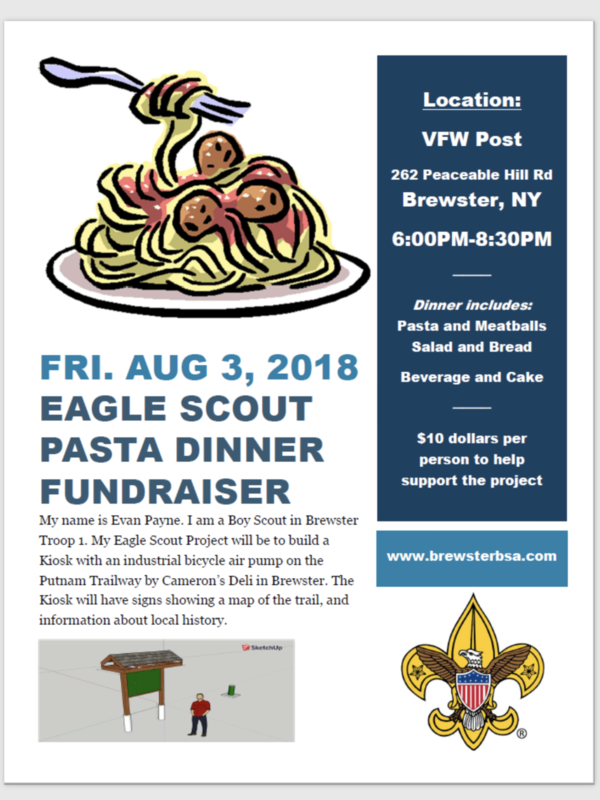 Troop Meetings for Brewster Troop 1 will begin on Tuesday, September 8, 2015 at 7:30pm at the Brewster High School Cafeteria. Prospective Scouts from sixth through twelfth grade are welcome to come to any Tuesday evening meeting to meet the troop. Check the Troop Calendar for additional details on the Troop’s events for 2015-2016. We have been fortunate enough to have Troop 1 boys continuing to rise up in BSA Rank Advancement, making more boys eligible for positions of leadership within the Troop. Several boys have become old enough to join the Senior Patrol and several other boys have earned First Class Rank, allowing them to take on the role of Patrol Leader. Check out the newly organized patrols on the Patrols Page.